by Emmanuel Nataf at Reedsy. We’re here to tell you: never fear. All authors have gone through this hurdle, and all of them have emerged more or less unscathed from it. 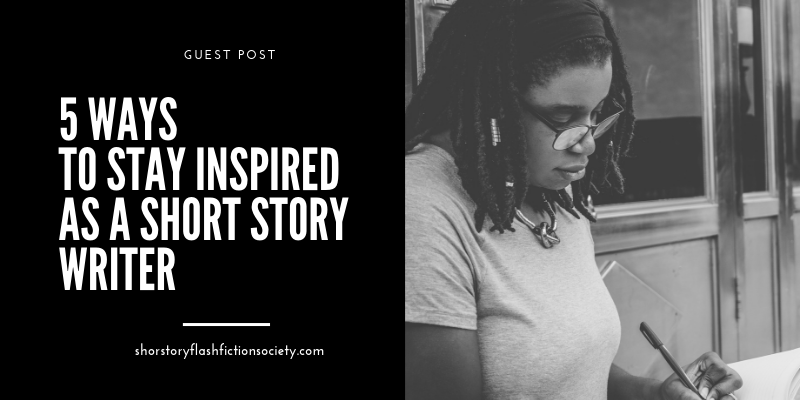 Here are five of the most popular ways that you yourself can stay inspired, especially as a writer of short stories. One more time for the people in the back: read, read, read! Re-fueling your imagination through other writers’ works is one of the oldest — and most important — tricks in the book. This includes reading both the good and the bad. Indeed, you might find that a poor piece of writing will inspire you to write in order to create something better. So cast your net wide and don’t be afraid to read outside of your genre. The more you write, the more you’re giving your imagination a chance to take flight. What you produce doesn’t necessarily need to be a superb show of writing: Maya Angelou, for instance, once said that she might jot down, “The cat sat on the mat, that is that, not a rat,” just to write something. What matters is that you’re showing the blank piece of paper that it’s not the boss of you. And even if you don’t feel inspired, you never know when the muse will take hold of you again. So your best option is to keep writing until she comes. If you’re worried that you might run out of things to practice writing, writing prompts are a great way to keep you inspired. This page has more than 250 writing prompts, so go for it. Even a 10-word piece would be a great result. Who knows? You might even get a fully-fledged short story out of it. When Agatha Christie was running low on inspiration for her short stories and novels, she used to take a stroll and observe her surroundings. By this, we mean not just the scenery that she walked past, but everything: the people on the sidewalks, the people in coffee shops, the conversations that she passed (and eavesdropped on). This one might seem a bit odd, but it’s a proven technique for inspiration that many writers have expressed in interviews before. So instead of going over what you have, it might be more useful inspiration-wise to imagine what remains in the space of all that you lack. This tip for inspiration comes straight from Marilynne Robinson, who came across some metaphors that she’d previously jotted down while writing her dissertation. The list of metaphors came together for her to give her the seed of an idea for her eventual novel, Housekeeping. You can even kill two birds with one stone if you build a running list of figurative language, since it’s sure to come in handy while you’re writing as well. For short story writers, this might be especially important, as the use of figurative language is vitally important in a piece that’s meant to pack a punch in a short amount of time. There you have it — five ways to gain writing inspiration when your mind might feel dry as a desert. And whichever method you choose doesn’t matter: what matters is that you emerge from it with a burgeoning short story in hand.